Demand for outdoor noise barriers in the US is forecast to rise 3.7 percent annually to 9.5 million square feet in 2019, valued at $191 million. Concrete will remain the dominant material and will offer the best growth opportunities. Highways will remain by far the largest market, but will be outpaced by the building construction segment. 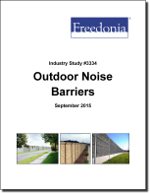 This study analyzes the 7.9 million square foot US outdoor noise barrier industry. It presents historical demand data (2004, 2009 and 2014), with forecasts (2019 and 2024) by material (e.g., concrete, metal, wood, plastic), market (e.g., highways, aviation, utilities and railroads, building and construction) and US region. The study also considers market environment factor, details industry structure, evaluates company market share, and profiles 35 industry players, including Oldcastle Precast, Coreslab, and Smith-Midland.